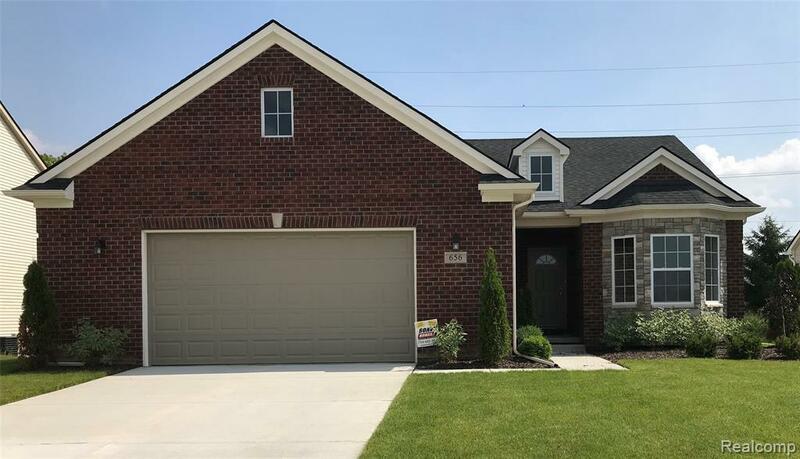 This well-designed, new construction Catalina "C" ranch style home comes with brick stone and a bay window for stunning curb appeal and includes a 2.5 car front entry garage with an 8? garage door opening. Inside boasts a beautiful cathedral ceiling plus 9? ceilings throughout the first floow. Hardwood flooring in kitchen, nook, great room, entryway and hallways. Kitchen with large pantry, beautiful cotton finished cabinets, a peninsula island and an open and inviting great room with canned lighting and ceiling fan. Granite counter-tops in the kitchen and bathrooms. Ceramic tile baths, master bath with walk-in 3 x 5 ceramic tile shower with a large seat and European shower door. Large, ceramic tiled laundry room with garage entry and large, mudroom coat closet. Full basement has open, carpeted stairs. Dry-walled and insulated garage.